Overview:With their amazing landscape, unique shapes, and ethnic customs and culture deposit behind themselves, Yuanyang Hani Rice Terraces are the excellent places you must take your cameras there. Yuanyang Rice Terraces are also, as mentioned the wonderland of tourists, a paradise of painting clubs and photographers! With their amazing landscape, unique shapes, and ethnic customs and culture deposit behind themselves, the scenic areas of Yuanyang Rice Terraces are the excellent places you must take your cameras there. Situated in the south of Ailao Mountain in Yuanyang County of Honghe Hani and Yi Autonomous Prefecture, Yunnan Province, the Yuanyang Rice Terraces are known as an unprecedented masterpiece of the Hani Ethnic Group. According to the record, the rice terraces were worked out by the ancestors of Hani people when they relocated their homes to Ailao Mountain area from the Tibetan Plateau in around 2500 years ago. In Ming Dynasty (1368-1644), the emperor granted them the title of "Magic Mountain Sculptors". Being built up from generation to generation, the fields today on the mountains have covered an area of 11,333 ha. Now we can see the abstract pattern of terraced rice fields lie at an altitude ranging from 144 along the Red River up to nearly 3,000 meters above sea level. In Yuanyang, the terraced areas of interest to visitors are mainly found between 1,000 and 2,000 meters above sea level. From the tidy and well-constructed fields, anyone has to admit that it is a human engineering feat only made by those hard working people. Yuanyang Rice Terraces and their irrigation system constitute ingenious agricultural innovation. Ailao Mountain's temperate climate and large scope of vegetation provides adequate precipitation to water the terraces, but equal apportionment of water to each plot on each terrace requires special skill. The Hani people call their method of water management, "Carving Wood to Ration Water"; villagers from each household mark different gradations on a wooden cross and place it in front of the terrace's source of water. When water flowing into the terraces reaches a specific gradation, the flow ceases. This system ensures enough water for every terraced plot. 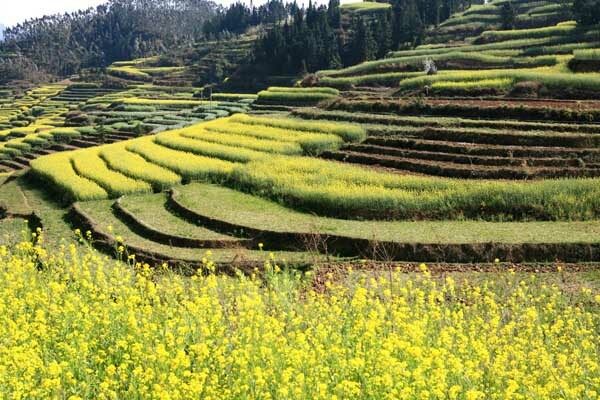 The best travel time to visit the Yuanyang terraced fileds are November, December, and from January to April. The winter temperatures in the terraced fields areas never freezing, they only support one rice crop a year. After the harvest, from mid-September till mid-November depending on the elevation, the terraces are filled with water until April, when planting begins. During these time, in addition to the terraces, tourists can catch many stunning natural wonders. Yuanyang Rice Terraces didn't get their names known to the outside world until the experts of 16 countries paid a visit to the terraces in Shengcun Village after participating in the first International Hani Ethnic Group Culture Seminar in Yuanyang in 1993. All the experts were stunned by the awesome beautiful terraced fields there. Despite the overwhelming scenic beauty of the terraces and its surrounding colorful local minorities, mass tourism hadn't developed there in the past few years, mainly due to its remote location, lack of a nearby airport. In the last two years, the roads reach there were improved, they have become a big draw to tourists and photographers. Located in the south (23km) of Yuanyang Old Town (Xinjiezhen), the Tiger Mouth Area mainly consists of Mengpin Village, Dongfu Village, Amengkong Village, Baoshan Village and etc.. The area covers 400 ha. terraced rice fields. The fields here are known as the most breathtaking fields of their kinds in Yuanyang area. Some viewing areas were built for enjoying and photoing the fields. The sunrise and sea of clouds in Tiger Mouth (Laohuzui) are also very beautiful, they enjoy the reputation as the terraced fields themselves. And being many Yi ethnic people live in the villages of this area, the area has become a base for studying Yi culture and customs. Look like a big gulf, Duoyishu Scenic Area is located in east of Yuanyang County, about 53 km from the county seat and 23 km from Xinjiezhen. Covered Duoyishu Village, Aicun Village, Dawa Village and some other 10 ethnic villages, this area is the optimum place to view the blue terraced fields (about 700 ha. ), sea of clouds, sunrise, sunset and the unique Hani and Yi people's mushroom-shaped houses. Duoyishu was once the major shooting places of the famous films -- The Story of Yunnan (1993) and Cherries (2007). It is a paradise of shutterbugs who enjoy taking the pictures of the beautiful sunrise. Bada Scenic Area is situated in 44km south of Yuanyang County, 14 km from Xinjiezhen. It has more than 900 ha. terraced rice fields including Qingkou Village, Quanfu Village, Zhulu Village and some other villages. From the foot to the top of the mounain, the terraced fields can be counted more than 3,900 steps. The Bada terraced rice fields are bravura, spectacular and stereoscopic, look beautiful in lines.